So finally Durga Puja / Navratri is here and so today I am up with my last minute 5 LIPSTICK recommendation for this festive season. As I am a matte lipstick lover so my recommendations are based on matte lipsticks which will suit all skin tone beauties. LAKME 9 TO 5 PRIME + MATTE LIPSTICK IN SHADE ROSY SUNDAY(Rs. 480/-). L.A.COLORS MATTE LIPSTICK IN SHADE MAD LOVE (Rs.395/-). MAYBELLINE LIP GRADATION IN SHADE FUSCHIA1(Rs.600/-). SUGAR COSMETICS VIVID LIPSTICKS IN SHADE BROWNTOWN ABBEY(Rs.599/-). 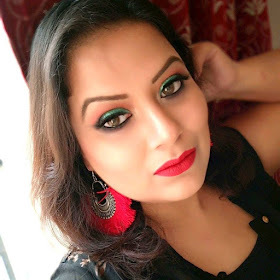 MAC RETRO MATTE LIPSTICK RUBY WOO(Rs.1650/-) (DUPE OF MAC RUBY WOO, COLOURPOP MATTE X LIPPIE STIX IN SHADE TRUST ME, price Rs.650/- - Rs.750/-). So, that's all for today. Enjoy this festive season and I will catch you in my next post.